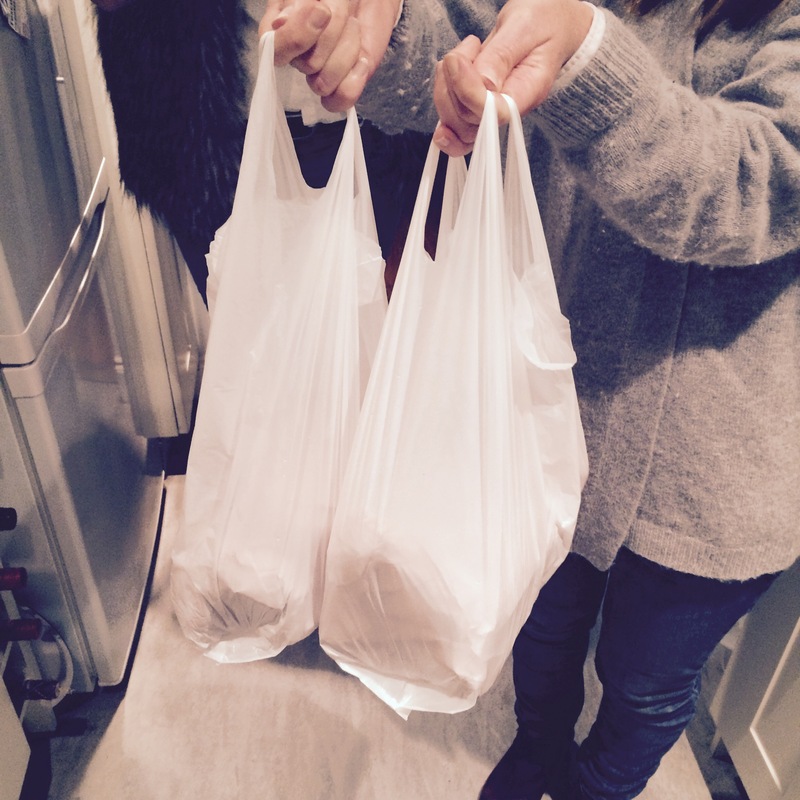 On Saturday evening my chums Chloe and Sarah came over laden with delicious fish, chips and mushy peas! Every so often it’s nice not to have to cook and be treated to a fishy feast. Chloe arrived first and we tried to wait patiently for Sarah to arrive with the food.. I had been teaching all day and had eaten a banana and a Nakd bar so I was DEFINITELY ready for supper! As soon as the door opened Chloe and I cheered and made our way to the kitchen where we were joined by the lovely Sarah. The fish and chips were smelling so good from the bag that I could feel my tummy doing flips in anticipation. I decanted the tartare sauce into a pretty bowl and chopped up a lemon into wedges ready for our feast. We unwrapped our little fishy parcels and got stuck in. The fish and chips were from Neptunes on Heavitree road. A short walk from my house. Sarah said they cook all the fish and chips fresh to order so you are guaranteed a piping hot package. I thought the fish was very good. The batter was pretty light although I think it might have got a bit steamy in the paper parcel that some of it had lost its crunch. It was still tasty though. The chips were good too. Thickly cut and cooked to perfection. We all had a side of mushy peas.. So good but always look like a pot of green toxic waste! The weekend carried on in piggy style on Sunday. Steve and I went out for a little walk on Sunday afternoon to get some fresh air and decided tea and cake was in order. We stopped off at Tea On The Green overlooking Exeter Cathedral. I had a cream tea and Steve had a slice of carrot cake. I had the “Wells” tea, basically a cream tea with two homemade scones, clotted cream and strawberry jam. The scones were tasty but very crumbly. Quite a lot of my first one ended up in the floor. I couldn’t manage the second one so I wrapped it in a napkin and took it home. Waste not, want not as they say. It’s pretty quaint and old fashioned at the Tea On The Green but I kind of liked it. It reminded me of the old fashioned tea rooms in Sidmouth when I was a little girl growing up. They have a full menu too if you don’t want tea and cakes. The table next to us were eating some rather spectacular looking roast dinners. I noticed they had a nut roast option for veggies too. I quite fancy trying a roast out one Sunday. Serena came over for a bite to eat midweek and to toast the little ginger Miss Marple. I had popped some sweet potatoes into the oven until they were soft and sticky. I cut them open and served them with soured cream and the greens from a few spring onions.. I have to say that it was a winning combo! I served it with a spinach, pear, fig and Stilton salad. 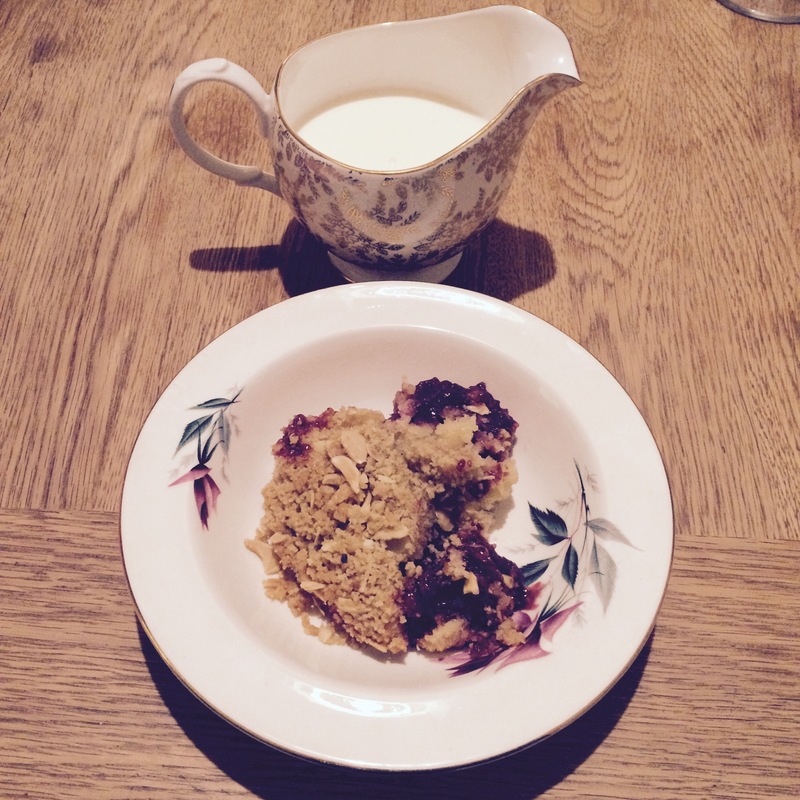 Serena had brought over a lovely cherry and almond crumble with cream.. (Thank you Marks and Spencer!) It was very tasty.. So much so I want to recreate it myself! 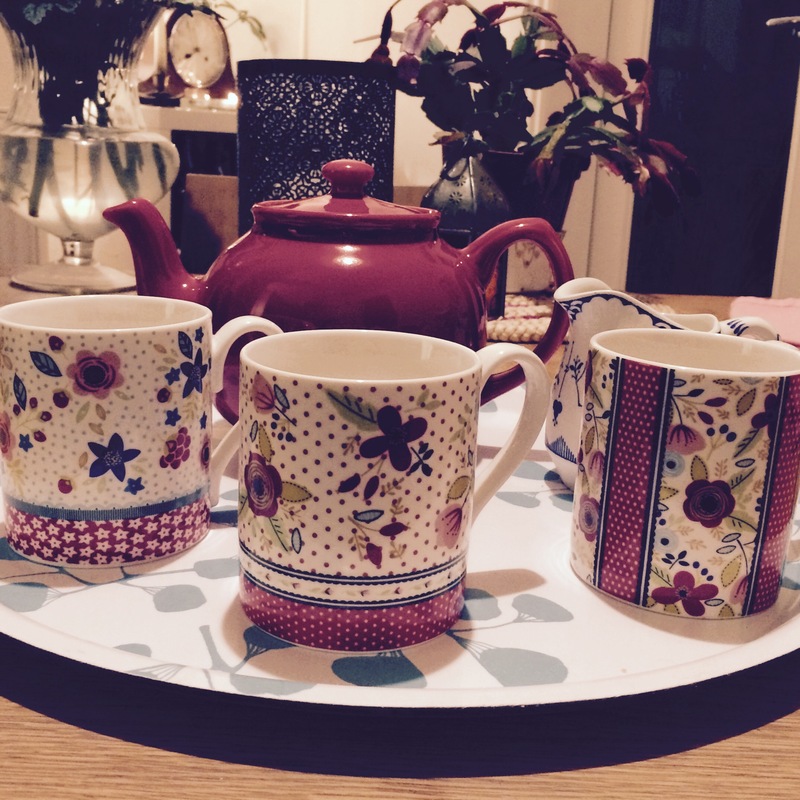 We followed it up with a lovely pot of decaf tea. Can I just say I am totally in love with my new bright red teapot.. It’s a beauty. Thanks The Caravan Trail. It is reminiscent of the teapot my nan had when I was a little girl growing up. I am sure it will be well used in its new home. Steve and I visited Project Vino in the week. It was the last night at their pop up location in South Street, Exeter. We had been a number of times over their two three month pop ups and always had a thoroughly enjoyable evening learning about the various wines we were tasting. I hope to see them back in the city very soon. I don’t think a week goes by when I don’t visit The Glorious Art House and this week was no different. Steve and I had been to the vets to pick up Miss Marples ashes which was very upsetting for us both. We fancied going somewhere for a cuppa and The Glorious was our first choice. It’s one of our favourite places to go. We always get a warm welcome and the decor is so uplifting it seemed the obvious choice after doing something so sad moments before. Steve had an Americano and I had a tea.. Perfect to talk over our morning and reminisce about our lovely ginger puss cat. On the way out I was handed a sample of chai powder which I can’t wait to try. Perhaps with my breakfast? I love a chai latte.. Especially at this time of the year. It’s slightly spiced which feels very autumnal and warms you from the inside out. 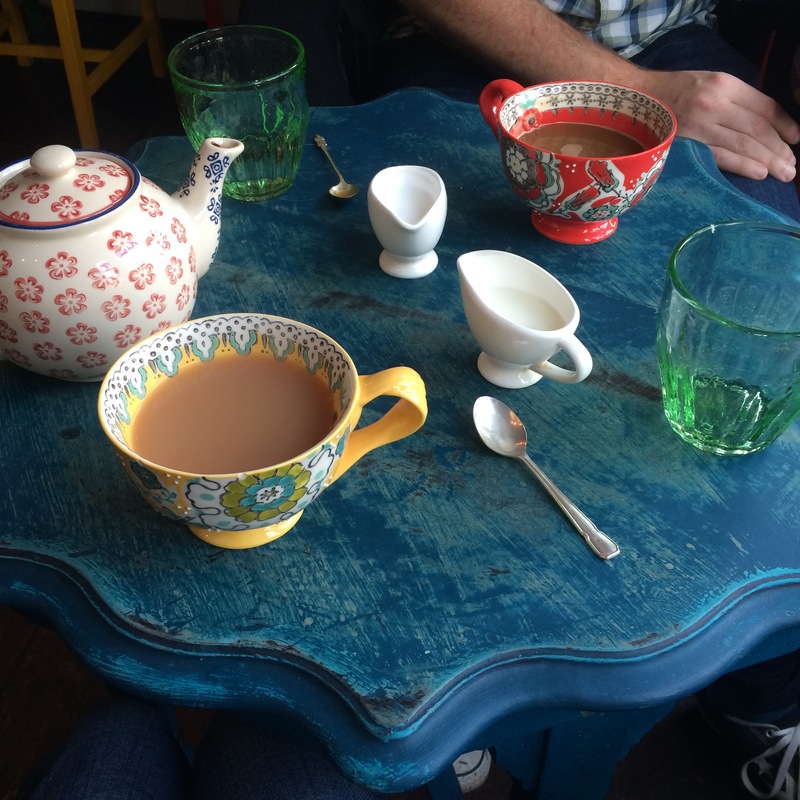 They serve Artisan Chai at The glorious so if you want to try it for yourself pop down there! I have lots of exciting plans over the next week. Steve will be celebrating his birthday so we have guests visiting and lots of plans to do lovely things. I can’t wait to experience it all and tell you all about it. Have a wonderful week everybody. Wrap up warm!